How about we have the Windsurfing Safety Discussion here, rather than the thread about Neil's welfare. I had a recent near miss with a Tourist Boat in Mandurah, and I made an official complaint to Marine Safety Investigations, and was called by an officer who said that I had right of way, but that I correctly took evasive action to avoid a collision. He stated that the powered craft should have given way to sail (me). Investigations stated they would contact the company that ran the tourist boat. In my case I could see the boat. In many cases we have a blind spot, this is what worries me the most..
4.fishing vessels "engaged in fishing, with gear deployed"
#1 seems obvious, since the overtaking vessel always has to give way. #2 is common sense, and applies to large or fast ferries etc. that would not be able to stop. #3 applies to large boats in shipping channels, but it may also be of relevance in shallow areas (like Mandurah Bay or near the sand bar in Melville). #4 is interesting in that it only applies "when engaged in fishing", and more specifically when that reduces maneuverability. It "does not include a vessel fishing with trolling lines or other fishing gear which doesn't restrict maneuverability", according toboatus.org. But for large fishing vessels in shipping lanes, points #2 and #3 may still apply. That is perhaps the biggest problem. As Sparky says, there can also be a big blind spot where we cannot see through the sail. During our short time in Oz, I was close to at least two "almost" collisions between windsurfers where blind spots played a big role. Power boaters tend to only look forward, especially when in a channel, which effectively also creates big blind spots to the sides. Two crafts on a collision course with two matching "blind spots" is an accident waiting to happen. The only way to avoid this is by (a) eliminating your blind spots by looking around more, and (b) assuming that you are in the other guys "blind spot" - regardless of whether his blind spot is caused by body position, sail, ignorance, or stupidity. The law in Western Australia is set out under the Western Australian Marine Act 1982 and the Prevention of Collisions at Sea Regulations 1983. Power driven vessels must avoid and/or give way to all sailing vessels (includes windsurfers) when under sail. Ships, tugboats with tows, commercial ferries and fishing vessels have right of way over sailing vessels. Yachts including other sail craft and windsurfers should stay well clear of these vessels. The overtaking vessel must keep clear. This also applies when a sailing vessel or windsurfer is overtaking a power boat. Any action taken to avoid collision shall be taken in accordance with the regulations and shall, if the circumstances of the case admit, be positive, made in ample time and with due regard to the observance of good seamanship. Over here on the east coast we have the worst ( 100% at times ) blind spot in the afternoon, particularly late. And windsurfers are the risk to surfers and swimmers. You drop in down the line and have to continually peak around the front of your sail to spot the dark shadows , even doing a head count doesn't even work. I could not apologize enough to a young girl once after she yelled at me ( reckons I missed her by cm's ) - didn't even see her! I think that is one that all us water users should be cautious of. If we went to court for a collision and talked about blind spots or sun in our eyes I guess we'd get hit with slow right down to suit the conditions. Which I guess come straight back to common sense like others posted above and always being aware of your surroundings. My experience has been that there seems to be a fair about of confusion regarding whom has right of way in various situations on the water. And I include us windsurfers in that. Of course, there are going to be accidents that are unavoidable (such as Neil's) but at the end of the day, you have to look out for yourself. To assume that the other person understands the rules and/or is prepared to follow them is a recipe for disaster. Being the smaller craft we are the ones with the most to lose and, unfortunately, need to act accordingly. Of course, there are going to be accidents that are unavoidable (such as Neil's) but at the end of the day, you have to look out for yourself. To assume that the other person understands the rules and/or is prepared to follow them is a recipe for disaster. I'm absolutely certain Neil's accident was avoidable if the person navigating the tinnie boat had bothered to look not just ahead but to the SIDE. I heard from another person the couple who were on the tinnie never saw a thing till impact. On the part of Swan River where windsurfers sail nearly all powered craft sail directly down the river towards Fremantle or directly up the river towards the city. Windsurfers on the Swan sail from Applecross to Nedlands - a direction 90 degrees to the power boats. After these two almost identical accidents it is clear to me tinnie boats with their grey aluminium finish need to be by regulation painted a much more visible colour. I meant "unavoidable" from Neil's position. Good idea Peter, Yeah painting boats would help, but then who would pay for that ? I couldn't imagine councils or gov. wanting to foot the huge bill. Maybe a pole and flag like us kayakers use mounted at the bow might be more affordable option so we can see the boat. Has worked well for kayaks. 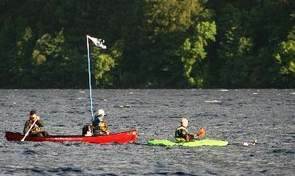 Sorry, really bad pic off the net, my kayak safety flag pole and larger flag are bright orange and can bee seen for miles, only $15, would be a lot cheaper than painting all tinnies around Aust. Had a near miss tonight, I'm the only one out on the bar with a small swell. The boat went behind me by 50 m. It was traveling west to east at speed. I'm traveling sw to ne at speed, didn't see or hear it until it passed. 50m looks a lot when stopped , but not with two closing vessels. Be safe everyone. If you get hit by a boat as opposed to your equipment hitting the boat - well I'm afraid you'll die or worse. The latest two accidents I'm pretty sure it was our equipment that hit the tinnies and our injuries were a result of our massive catapults into our gear. I am amazed. Every single boatie should know that. They clearly do not, and its scary as its so fkn simple. I don't think all boats painted or flags will help as if they're coming from your leeward side there will always be a blind spot. Whereas, the power boat skipper always has a view to the front and out each side- probably why the rule has existed as-is for a bloody long time. The rule makes sense. This has more to do with a lot more people in boats due to wealth, population increase in Perth etc, leading to congestion, and a few skippers that don't give a fk or just ignorant Still - how can they not know ROW rules when the Govt introduced the RST due to boating incidents??? Pretty sure you've seen it more than once. I see it more than once every time I go out. Sometimes before I have even got on the damn thing. If you beat that 9 year old kid in the top photo down the mountain I'll buy lunch. Most power boaters are idiots and all should always be treated as such. Keep you eyes peeled. I'd be just be happy if all windsurfers would learn to give way to others who are on on starboard tack. Sick of giving way when I'm on starboard. I won't include kiters in that bc I'd be wasting my breath..
Kayakers ...aren't you guys known as the "speed humps of the seas"
Can be dangerous in a kayak though when you are in a sailboarders blind spot and they are doing 20knts lol. Had this happen to me at Urunga, thought it was carantoc at first, but the rig had a rider on it. As a tinny owner - there is no F'n way you can miss something travelling perpendicular to your path - you're in an open Tinny for F-sake...it hasn't just popped out from behind a brick wall. Its going to be in your front facing field of vision for some time before you actually cross/hit - so plenty of time to take evasive action and not leave it until the last second - and if for no other reason than to protect your own boat from collision! How these so called 'skippers' can not see a 4-5m high, bright as dog's balls sail, ...is beyond me. In SA, a boat licence is theory test with no practical time on water, no training, no retesting and no need to renew it - EVER! Its no wonder there are so many "Boat Fails" videos floating about. We can see front and back, and we can see through the window of the sail to leeward some extent if we make the effort to look. What concerns me is the blind spot to windward. You cannot safely check behind your back. In the car that problem has been solved with a rear view mirror and side view mirrors. Maybe we need to use something similar - like the rear view mirrors which attach to a bike helmet, or a smart glass windsurfing helmet with built in camera to the sides , or a reflective panel on the sail? Agreed Windxtasy, when up the goldie, probably one of the busiest boat areas in Aust. I look out for myself, there is NO chance of one of those speed boats stopping to let me cross their channel. I think your mirror and Petermac, who was in one of the latest accident, so knows, are probably on the right track thinking outside the box and not depending on current situations that obviously aren't working. Time to lead, not follow. In SA anyone with a drivers license can hire a 10-15 berth House boat with no boating experience, yet if you want to use a tinny you need a license. Yep, crossing a channel Is like crossing a road, look left and right and give way to oncoming traffic. A couple of times off Sandon Point windsurfers have found themselves blasting through pods of frolicking whales. Except they didn't know about it until told later on by observers on land. " What whales? " It happened to me and I came to the conclusion that negotiating chop, doing the visual processing on each individual piece to get through smoothly, requires so much brain power that our peripheral vision can be almost shut down. You've probably done this test before. Maybe everyone should do mandatory course racing, the different angles you are required to sail make you much more aware of what is upwind and downwind of you. No thanks The only way I would do that if you included a truck driving lesson for all car drivers as well. I suspect that the idiot boats drivers have the same issues on land with trucks. According to Rodney, Neil's good mate, the couple on board were completely useless when it came to dealing with the situation or providing any sort of assistance. Simple answer, be aware of your surroundings and assume NOTHING. Way too many idiots out there with an RST, like my 14 year old got and even now she doesn't really know port from starboard or ROW. Lack of water time admittedly but isn't that reflective of most small boat owners ? The maritime courts make it very clear that you have to slow down if there is a risk of collision. They don't even refer to "right of way" any more because that term implied that one vessel was in the right. Most of the time they say that if there is a collision, both vessels are in the wrong (although to differing degrees) because both vessels should have done more to avoid it.